Bloomington Montessori School is a long-standing beacon for alternative education in the Monroe County community. The expansion includes two classrooms, a library, a music and foreign language room, an administrative office, restrooms, an outdoor pavilion and play yard. The design reflects Montessori’s educational philosophy in its space layout and use of materials, and it capitalizes on the Owner’s limited budget and tight site. 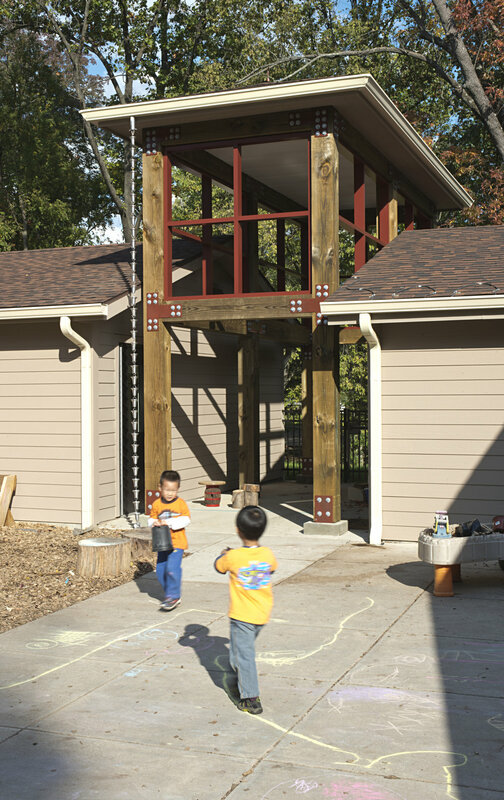 Responding to Montessori’s belief that students learn best from the natural world, the design creates courtyards which weave nature into the building and outdoor play spaces. These same courtyards, combined with a central outdoor pavilion, knit together the new addition and existing building. To integrate the campus, the addition borrows roof forms, building materials, and colors. Large open “free range” classrooms provide views toward the natural setting, and generous window seats encourage students to engage their imaginations. Interior finishes in blue, green, yellow, and clay reflect colors found in nature. The variety of ceiling forms, combined with flexible lighting levels, provide learning activity zones within the open classrooms. A library connects the two classrooms for shared programming. Cubby areas and restrooms are located for controlled access by students.